... that in the year 867 the count Boson realised that life is short and that he had yet to make his name immortal. We find the count in his chambers, contemplating his fate. My neighbour, Count Tour de Pin, has always been a craven pig. His people would most likely welcome a change of leadership. It so happens, as well, that I have a cousins mothers something-or-the-other who was a relative of the late count of Venaissin. Clearly the county should have been given to me when he passed away! I must consult my Master-at-arms about the condition of our levies..."
This the count did and the armies were found to be ready. However, with the declaration of war in the hands of Tour de Pin and the soldiers marshalling in all towns a courier from the king arrives. Can it be that the king has decided to interfere? The King, may he live for ever, has not in fact decided that he desires my head on a silver plate. Instead he's decided that it should bear a silver coronet. In other words, he has given me the title of Duke of Provence. 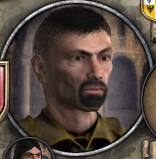 Rather than have a troublesome vassal such as de Pin plot and intrigue against us we will attempt to bring harmony to the realm by getting rid of him. We quickly form a plot to have his lands revert to the crown, which of course is Duke Boson. Since Bosons skills at subterfuge vastly outstrips those of that bearded oaf de Pin it takes little time for us to find enough support to send a little letter showing him the impossibility of remaining in his current position. After a few days of private deliberations the count sends a reply. He accepts our demands for the good of the realm and will retire to a county in Aquitaine where he will serve a new master. As a last sign of defiance he adds that "His new master knows to value his vassals more than his last.". After this successful coup there is some grumbling in the ranks about the duke holding rather too many holdings for a man of his stature. The general opinion seems to be that some of the counties should be given to loyal vassals. Loyal vassals? Nonsense, I say! Insubordination is what this is. The ringleader is the dastardly Prince-Bishop of Nice. Fortunately he is a man of no great skill at intrigue, just like Angilbotto Tour de Pin. After a few well chosen words with my other vassals a letter phrased much the same as that sent to Angilbotto is carried to the ruler of Nice. He is a man of character though and refuses to give up so easily. War is declared and our armies marshalled without delay. Our spies count the enemy forces at around 300 men which is less than half of our 800 man strong army. Not even their advantageous terrain will help them. Battle is joined on the 25th of May as our valiant shieldwall fords the river and push up the steep hill supported by the archers on the right flank who send wave after wave of arrows towards the enemy. Our foe cannot hold under the furious onslaught of our men and soon signals the retreat. All but a small fraction of the fleeing soldiers are caught and the way to Nice lays open. 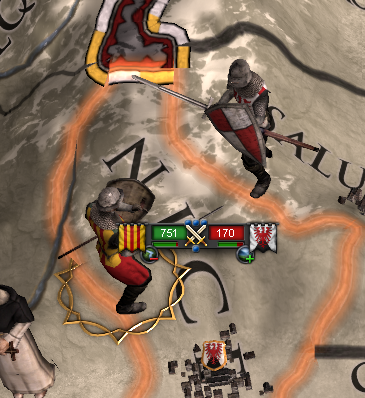 The following siege is both short and bloodless since the garrison only consists of 17 old warriors who quickly yield at the sight of such a mighty host. The Prince-Bishop had indeed put everything he had into the main battle and has no reserves left. With the victory complete and all-encompassing we personally take possession of the final part of our dukedom. 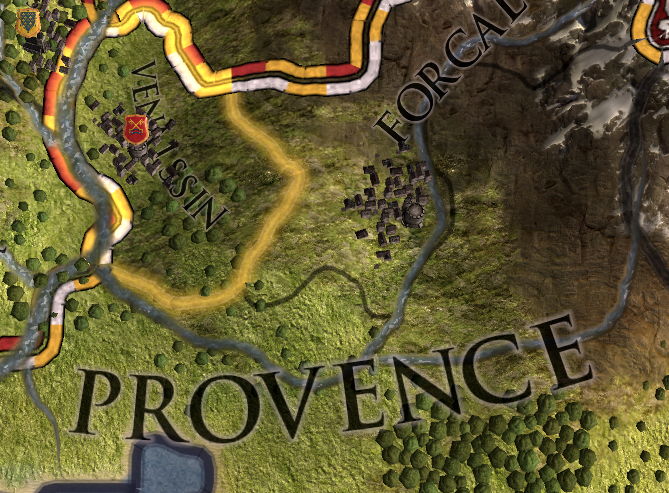 The good duke Boson returns to his capital Arles in Provence with a feeling of accomplishment, having doubled the size of his demesne and fought a successful war to establish peace and prosperity throughout his lands. However, it will be difficult duke Boson to manage them all himself and we will have to either find trustworthy noblemen to rule the lands in our name or find some way to improve the administration through research or further education. There is also the possibility of doing nothing and handing over the resulting troubles to our heir who promises to be a most competent ruler. All this and much more in the episodes to come!